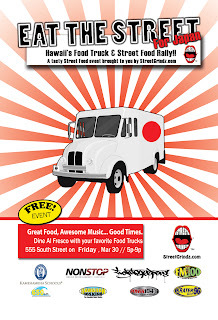 This month, forty food trucks and food booths set up in a Kakaako parking lot for some good grinds. Shiitake Mushroom Empanadas from Camile's on Wheels "Special for the Event"
Special Bento Box Dessert Sampler "Special for the Event"
I LOVED the Lemon Squares! MOMO-Chi Burger "Special for this Event"
mochi frico, nametake mushrooms, negi aioli, and heri nori. Met up with an old friend @onokinegrindz and new friend @konish for a different Japanese experience. I've had Japanese food all over the place, even Japan, and Sushi Izakaya Gaku doesn't have the typical Japanese menu. Since it's an Izakaya, the menu is more Japanese tapas or small plates and great for sharing. Served with a quail egg, masago, and green onions. I usually don't order this, since most chefs today don't know how to make it. This was one of the best I've had outside of Japan. It was dried and toasted, nice seasoning. Today is Ramen Monday and I'm in a Hurry! 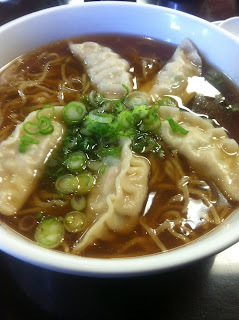 So, I'm having my gyoza in the soup. I don't have time to wait for my order to be served in two parts. I don't know, maybe I'm asking too much... What do you think?